GenNation Learning Center: Happy Thanksgiving! Getting ready to celebrate Thanksgiving? In addition to giving thanks, use this holiday as an opportunity for civic learning. 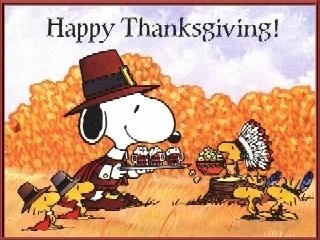 Thanksgiving commemorates a feast shared by colonists and Native Americans in Plymouth in 1621. This started a tradition of harvest celebrations that lasted for 2 centuries. In 1777, the Continental Congress declared the First National Proclamation of Thanksgiving. George Washington, then a war leader (later to be president) declared Thanksgiving to be a victory celebration honoring the defeat of the British. In 1863 - in the middle of the Civil War - President Abraham Lincoln made Thanksgiving a national holiday. In December 1941, President Roosevelt set a fixed date for Thanksgiving - the 4th Thursday in November. Can you think of other situations where two different groups are brought together to share a meal? Are there similarities between the way Thanksgiving was organized by local leaders and how decisions and policies are made by local leaders in our community? What are the traditional Thanksgiving foods? Why do we eat different things for Thanksgiving than on another holiday, such as the Fourth of July? Why was Thanksgiving made official in 1777? Why did George Washington say it was a victory celebration? Why did President Lincoln declare Thanksgiving as a national holiday? Is it significant that he did it in 1863? Why did President Roosevelt set the annual date for Thanksgiving? Why was this done in December 1941? If you were President, would you declare a national holiday? What would it be and why? Write your proclamation, read it out loud and discuss with your family or classroom. Do other countries celebrate Thanksgiving? What is similar or different? Does Thanksgiving impact the economy? How? Which industries? Have you attended a Thanksgiving parade or watched one on TV? What are the different kinds of government involved in the parade including planning the parade route and keeping the streets safe?